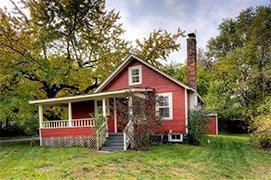 This wonderful one and a half story bungalow built in 1920 will welcome you home. With a welcoming wrap around front porch that invites you in, you are greeted by a cozy great room with hardwood flooring and a fireplace with a wood burning insert, that can heat most of the house. A charming reading area sets off the great room and is steps away from the first floor master bedroom. The hardwood floor continues into the kitchen which is equipped with all appliances including a dishwasher. The covered deck off the kitchen is perfect for the BBQ enthusiast. The full basement is dry and partially finished. The laundry room is here and comes with washer and dryer. Outside features a nice treed lot with a two car detached garage. 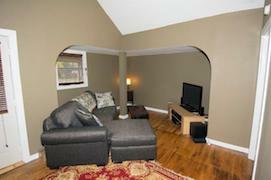 This home is perfect for first time home buyers, singles or couples. Close to shopping, restaurants and just minutes away from Canton and Ann Arbor. Make an appointment today to see this charming Ann Arbor real estate and you’ll be glad you did. 13 month Home Warranty of America paid by Seller!